Located in the heart of business area on prestigious Fountain Square Azcot Hotel is offering You accommodation on bed & breakfast basis.Our premises built in the 19th century is only steps from business centers and embassies, best restaurants,Cinema theatre, National Park, boulevard, and historical part "Old City". All this makes it a prime location for both business and leisure. Azcot Hotel offers comfortable, value-for-money accommodation for both travelers on a budget and Corporate quests looking for a competitively-priced room in the very heart of town. During your stay at Azcot Hotel from arrival to departure You will be provided with all the comfort and assistance that one would expect to have at a superior Hotel. You will be met and served by our friendly staff which has sufficient business experience in tourism and hotel management and able to speak several foreign languages (English, Russian, German, and Turkish). 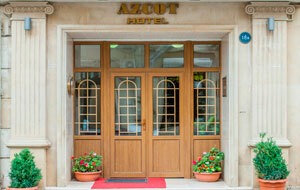 The Azcot Hotel is located in the city center next to the key transport areas, metro and bus stations as well as the Central railway station. 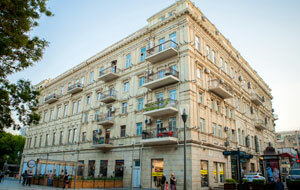 Convenient location allows our guests to quickly reach any point of the city. 8 km/22 min to the International Bus Terminal.